The canal is a man made water way comprising of locks and irrigated rivers. The canal's purpose is to allow cargo barges to navigate fromt the Atlantic ocean to the Mediterranean sea via the river Yonne and Seine to the river Saône and Rhône. The canal was built to climb in altitude and pass across the hills and watershed of central Burgundy. The canal was built to climb in altitude and pass through the hills of central Burgundy which create a natural watershed that is the division of the "Partage des trois mers" (The separation of the "three seas"). The location of the geographical feature is located beside the village of Meilly-sur-Rouvres a few miles from the tunnel & Pouilly en Auxois. 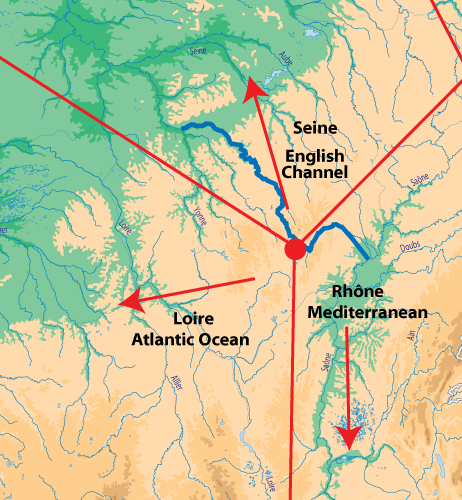 As you can see in the above map, the watershed dictates the flow of water into three different bassins of water flow, the Loire, the Seine and the Rhône which in turn flow into the Atlantic Ocean, the English Channel and the Mediterranean Sea. This particular canal is naturally supplied with water from upstream. There are more than 63 kilometres of “secondary canals”, with the sole purpose of supplying water to the canal from the reservoirs and rivers. This is different to “Lateral Canals” which follow rivers, they will use the water from the river, which they are following and are generally constructed to allow boats to navigate whilst the river is unstable due to flooding or lack of water. The length of the navigable waterway is 242 kilometres and is divided by 189 locks. Each lock is of a standard "Freycinet" size and able to lift or descend a barge of 250 tonnes, 38 metres long and 5 metres wide. Learn how to operate a lock with our interactive animation showing the different steps in operating the lock to allow boats to pass through. This will be very helpful for those who have never operated a lock, as some sections of the canal require you to lock yourself through without the assistance of a lock keeper. There are also fully automatic locks which only require you to push a button to start the locking through process. There are a 189 locks on the canal. The distances from one lock to the next, from the Yonne and from the Saône. 113 locks on the Yonne side, from Laroche Migennes to Pouilly en Auxois. 76 locks on the Saône side, from Saint Jean de Losne to Escommes. The map above shows the flow of water on the canal. Lock calculator, for distance and cruise duration between locks.